Set in May and early June of 1940, Darkest Hour begins with the downfall of Churchill’s predecessor, the terminally ill Neville Chamberlain (Ronald Pickup), remembered today for his attempted appeasement of Hitler. 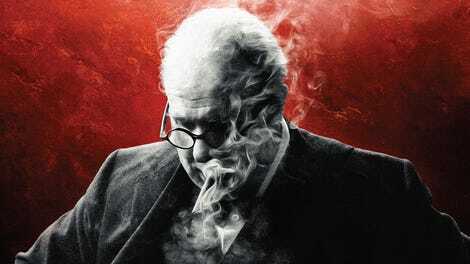 Reluctantly appointed to the premiership by King George VI (Ben Mendelsohn, splendidly cast against type), Churchill begins putting together his cabinet, making sure to include both Chamberlain and the former prime minister’s close friend and presumed successor, Viscount Halifax (Stephen Dillane). While the vilified Chamberlain gets an unusually sympathetic portrayal in Darkest Hour—a dying statesman who doesn’t want to see Europe plunge into another Great War—Halifax gets handed the role of the scheming aristocratic villain. (Like Dunkirk, Darkest Hour keeps Britain’s German foes off-camera; apparently the House Of Lords was the next best thing.) At this point, the prospects of the war are dim: The United States and the Soviet Union haven’t yet joined the Allies, and the moribund French are neither inspired by Churchill’s hawkishness nor impressed by his butchery of their language. From the opening shot of the House Of Commons in a clamor, the surface of the film is busy, packed with tunnels and poorly individuated minor characters and brimming with theatricality: dramatic shafts of Rembrandt-by-way-of-’80s-music-video window light; snippets of conversation between gray-haired parliamentarians looping in and out of a long take like a Greek chorus of disapproval; tracking shots crossing the cutaway set of the underground Cabinet War Rooms bunker complex; a curtain of Macbethian fog drawing on a hangar; the “on” light of a radio microphone washing a room blood-red as Churchill reads a speech. The last one comes as a shock, as the colors of Darkest Hour otherwise appear to have been subjected to wartime rationing; everything is rendered in gradations of taupe and blue-gray. Wright’s staging is often eye-catching, guaranteeing that the film remains unflaggingly watchable even in its plodding stretches. But it never transcends the obvious: Churchill is a performer, politics is theater, the powerful can feel isolated, etc. 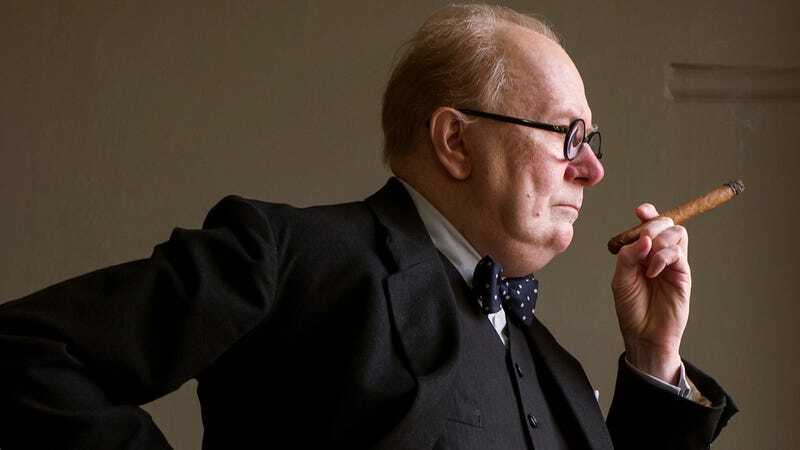 And while Oldman is barely recognizable in Darkest Hour, his Churchill is well-worn—the same funny, bullheaded, difficult orator familiar from half a dozen other Churchill biopics and from the prime minister’s own self-curated public and political persona. The closest thing that the movie offers to dramatic insights come by way of two excellent foils: Churchill’s wife, Clementine (Kristin Scott Thomas), and the aforementioned George VI. While Colin Firth won an Oscar for portraying the monarch as a man flabbergasted by his own stammer, Mendelsohn’s performance underplays the speech impediment; in the way he handles his unfiltered cigarettes, he reveals more character than Oldman does in two hours of gesticulating with cigars. Ultimately, the film’s heightened artificiality betrays its simplistic hero worship. The moment is a fanciful, dramatically obscene sequence in which Churchill escapes his chauffeured state car and decides to ride the Tube for the first time in his life, surrounded by ordinary commuters, who let him know what they think about the Nazis and stop short of taking turns to sit on his knee. It’s the sort of stuff that would make Frank Capra retch. (Screenwriter Anthony McCarten also wrote the mawkish Stephen Hawking biopic The Theory Of Everything; this is the scene where it really shows.) Perhaps someday we’ll get a warts-and-all portrait that doesn’t pretend like the only bad thing that Britain’s wartime prime minister ever did was make his secretaries cry. Because what can a movie really say about the tough decisions and responsibilities of leadership—a superficial theme of Darkest Hour—if it refuses to be tough on leaders?